When you think of sports, you usually think of something that takes a lot of physical effort. Golf is a bit different. Sure, you can get some walking in if you don’t take a cart. But mostly golfing is about coordination and skill and less about physical exertion. Until you want to practice driving. You hit a bucket of balls and then you have to go walk around and pick them up. Unless you have help, of course. In particular, you can delegate the task to a robot. The robot that [webzuweb] built looks a little like a plywood robot vacuum. However, instead of suction, it uses some plywood disks to lift the balls and deposit them in a hopper. The electronics consist of an Arduino and an Orange Pi Lite. A GPS tells the robot where it is and it develops a search pattern based on its location. Although [webzuweb] notes he isn’t done with the project, it looks pretty good. He describes the software, but it doesn’t appear to be posted anywhere. However, he does describe its operation and how it changes mode based on its current state. We can’t decide if golf is really a sport or more of a game. We were surprised to read that if you carry your own bag and don’t use a cart you can burn about 360 calories an hour which is somehow more than a gymnast burns, which hardly seems possible. Of course, most people use a cart and a caddy, so they aren’t going to burn those calories. If you are in the market for a cool cart, we liked this one. Or, perhaps you’d like one with more power. Morse code may not be as widely used as in its heyday, but it still certainly has its adherents. One avid user is Tanya Finlayson, who has been using this as her method of communication for roughly 40 years. Now, with the Gboard phone keyboard supporting input via dots and dashes, the world of Android computing has been opened up to her as well. In order to get button presses to the phone, Ken Finlayson used an Arduino Leonardo to read inputs from a trio of buttons, indicating dot, dash, and mode select. The third button allows for phone navigation in addition to text input. Because of its built-in HID capabilities via the ATmega32U4 chip, the Leonardo is a great choice for this application, demonstrated in the video below. Many people cannot use keyboards and touchscreens to control their digital devices. Instead, they use custom hardware switches that emulate typing, swiping, and tapping. The Android operating system provides software that allows these switches to control Android devices, and recently Google provided a new Morse Keyboard within the Gboard keyboard for people who find this method easier for text entry. 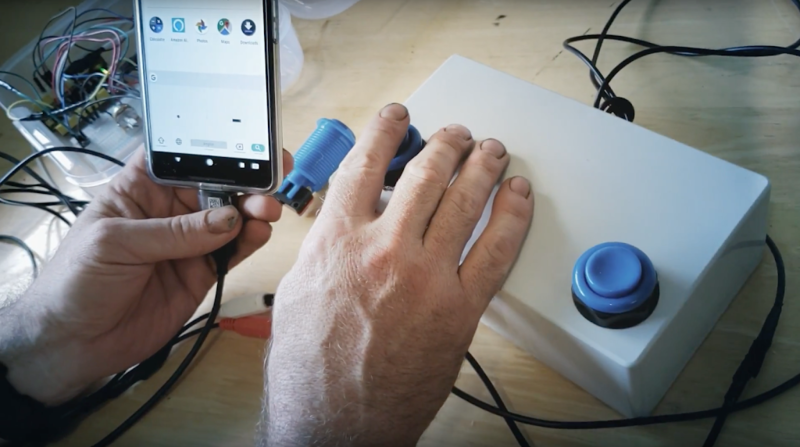 This experiment is a DIY hardware adapter that enables assistive tech developers to connect existing switch based input systems to their Android device. Once connected, 2 switch assistive systems (with an additional switch for mode switching) can control both the standard Android accessibility functions as well as text entry through Morse on Gboard. This experiment is built using Arduino and is compatible with most standard assistive 2 switch systems with 1/8” mono outputs. If you are an Android user and a big fan of Super Mario beware: there is no Android version! There has been no official news on the Android version yet, let alone a version of the game. There is, however, a version circulating outside of Google Play market that will steal your bank account. Right now attackers are taking advantage of the game’s popularity and Android users despair to spread malware posing as an Android version of Super Mario Run as they did in the past for Pokemon GO. The trojan is called Android Marcher and has been around since 2013, mostly targeting mobile users financial information. After installation, the application attempts to trick users with fake finance apps and a credit card page in an effort to capture banking details. The malware also locks out Google Play until the user supplies their credit card information. In this new variant of Marcher, it can monitor the device and steal login data of regular apps, not just banking and payment apps, and send the stolen data back to command and control (C&C) servers. Facebook, WhatsApp, Skype, Gmail, the Google Play store are all vulnerable. Criminals can exploit these stolen accounts to carry out additional fraud. To avoid becoming a victim of such malware, it is a good practice to download apps only from trusted app stores such as Google Play. This practice can be enforced by unchecking the “Unknown Sources” option under the “Security” settings of your device. We may add to turn on “App Verification”. Verify Apps regularly checks activity on your device and prevents or warns you about potential harm. Verify Apps is on by default, as is Unknown Sources turned off. Verify Apps also checks apps when you install them from sources other than Google Play. Of course, there is a privacy trade-off. Some information has to be sent about the apps you install back to Google. The main advice is: use common sense. It’s common practice for companies to release official apps versions through Google Play and highly unlikely to do it via any other way. 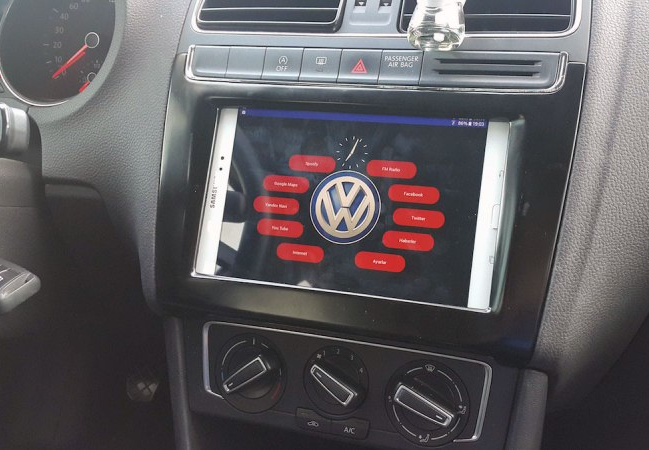 Unlike many cars today, Aykut Celik’s 2014 Volkswagen Polo didn’t have Bluetooth connectivity or an elaborate touchscreen navigation system. So, the Maker decided to take matters into his own hands and swapped out his “useless” radio for a Samsung tablet, putting Google Maps, Spotify and other apps right in his vehicle’s dashboard. 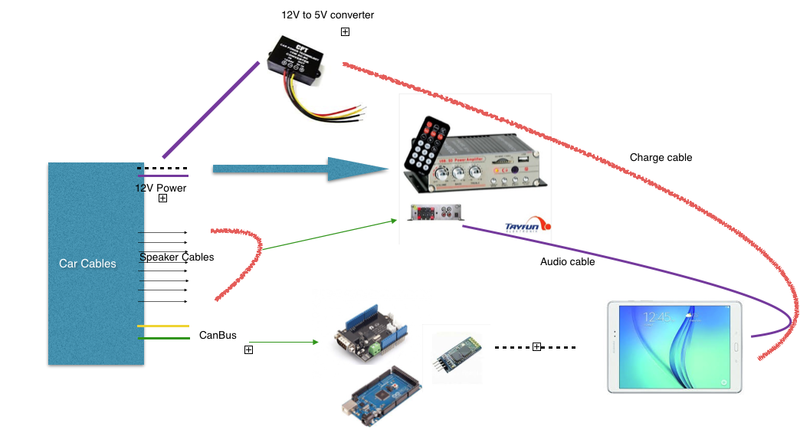 In order to accomplish this, Celik needed an amplifier (to replace the one attached to the prior radio), a CAN bus shield from Seeed (so he could use the steering wheel’s volume buttons), a Bluetooth module, and an Arduino Mega 2560 (for parsing data and sending it over to the Android device). A CAN-BUS shield is necessary to be able to read CAN-BUS commands from the CAN bus line… I used this shield for detecting wheel button commands like volume up, mute and volume down. Behind the car radio there are two CAN bus cables. One of them is CAN bus – HIGH and the other is CAN bus – LOW. These cables must be connected to green sockets on the shield. Using the SeeedCAN bus shield, you can sniff you car’s CAN bus data. The info which is gathered from CAN bus is transferred to the Android tablet via Bluetooth. There is a little app which is responsible, for example, reducing volume whenever the wheel volume button is clicked. And a menu activity to open other apps. You can watch the elaborate project below, and read more about it on Celik’s blog. The Maker has also made the software and other information available on GitHub. the Arduino is responsible only for detecting a) a goal scored and b) the gate in which it was scored. 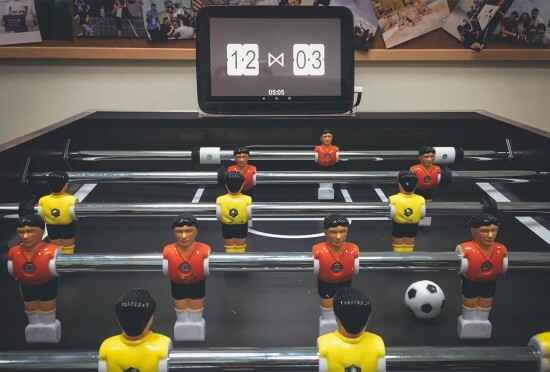 After a goal is detected the Arduino sends this data to Android tablet. App development is not fun for everyone, and sometimes you just want to control a device from your phone with minimal work. 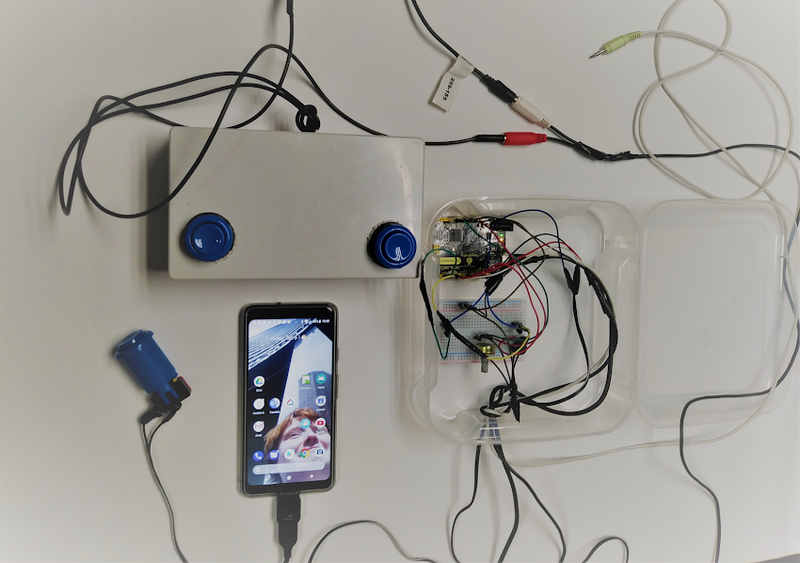 Blynk appears to be a fairly put-together library for not only hooking up any Arduino or esp8266 to a phone through WiFi, but also through the net if desired. There have been a few times where we’ve wished we could add app control to our projects, but installing all the libraries and learning a new language just to see a button on a screen didn’t seem worth it. This is a great solution. Have any of you had experience using it? Ever wish you could synchronize your brainwaves with an otherworldly luminescent plant from the comfort of your own room? The post This Trippy Arduino-Powered “Plant” Trains Your Brain appeared first on Make: DIY Projects, How-Tos, Electronics, Crafts and Ideas for Makers.